Scrap Arts Music - 11/15 at 8:00 p.m.
What happens when Stomp meets Blue Man Group meets Jellyeye Drum Theatre? Scrap Arts Music! Scrap Arts Music stimulates your senses. By bringing together five talented musicians, powerful original music, dazzling sculptural instruments and hyper-kinetic movement, the ensemble always leaves audiences wanting more. Based in Vancouver, Canada, this innovative troupe is led by percussionist Gregory Kozak. He is also composer, performer, and inventor of the transforming, futuristic instruments used by Scrap Arts Music. Kozak's awe-inspiring musical creations are handcrafted from the cast-away scraps of industrial production. His compositions are a groove-based fusion of world music traditions and 21st Century sounds. Passions and personalities pulsate wildly during Scrap Arts visually stunning and audibly unforgettable "action-percussion." Yesterday, Fermilab Today ran the story, "MIPP Collaborators Celebrate End of Preparation, Start of Data Taking." In the article, we state that Lawrence Livermore National Laboratory donated the detector central to the experiment, a time projection chamber. This statement is incorrect. Lawrence Berkeley National Laboratory donated this item to MIPP, not Lawrence Livermore National Laboratory. Fermilab Today apologizes for any confusion. Could snare scientific research critical to U.S.
WASHINGTON�Two national labs in suburban Chicago are potentially big winners in a 20-year roadmap of the nation's top priorities for new scientific research facilities announced by the Department of Energy on Monday. Four of the top 28 projects tied for third place in priority, and Argonne National Laboratory is well-positioned for two of them, including the $1-billion rare isotope accelerator and a biological research facility to mass produce and characterize proteins. It's hard to take a cheese seriously when it shares its name with both a subatomic particle and a computer application. Or, perhaps, it's hard to take the subatomic particle or the application seriously since they share their name with a cheese. However you look at it, quark, the cheese, has always deserved both its own identity and more respect. Quark is a fresh, soft, white cow's-milk cheese with a tart, tangy, milky flavor reminiscent of yogurt or fromage blanc. Its texture, however, is richer and denser, almost like cr�me fra�che. The cheese is thick enough to be a substitute for cream cheese on a bagel or in a dip, yet light enough to whip and dollop over sugared berries or a slice of fruit pie. DZero: Are there exotic Higgs particles? The hunt for the Higgs particle at the Tevatron has just begun. While searching for the Higgs particle predicted by the Standard Model of particle physics, physicists at DZero are also exploring various more exotic Higgs scenarios. The masses of neutrinos are expected to be small compared to the mass of other elementary particles like the electron. One group of theories which are prime candidates for explaining these small neutrino masses also predict an exotic kind of Higgs particle, the doubly-charged Higgs or H++. Fermilab is currently the best place in the world to look for the doubly-charged Higgs. Physicists working at Fermilab's DZero experiment have searched for events where these spectacular new particles would decay into two muons of the same charge. Such a process would violate lepton number conservation assumed in the Standard Model. 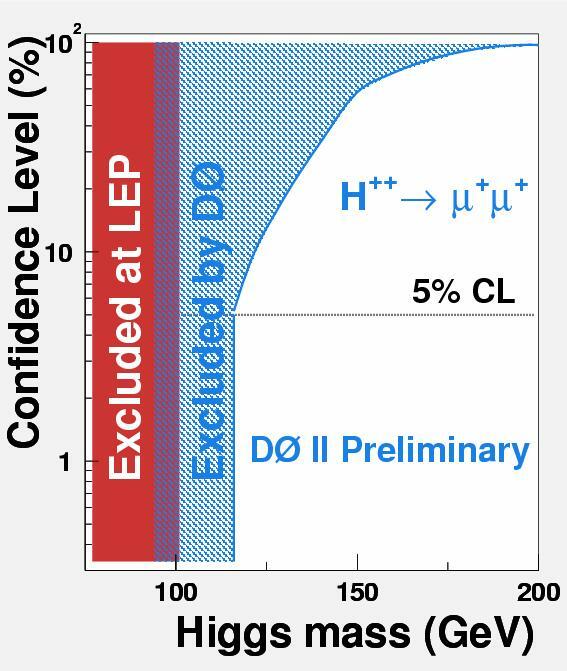 Using the data taken by the DZero experiment since 2002, DZero physicists have found no candidate events compatible with signal and can already show that H++ particles decaying into muons must have a mass greater than 116 GeV. This extends the previous world best limit of about 100 GeV obtained by the Large Electron-Positron Collider (LEP) at CERN. Marian Zdrazil (left), graduate student at the State University of New York at Stony Brook, and Stefan Söldner-Rembold, University of Manchester, are working on exotic Higgs searches at DZero. Mark your calendars! Fermilab's annual blood drive will be held on December 8th & 9th, 2003 from 8:00 a.m. to 3:00 p.m. in Wilson Hall. Appointments can be scheduled online or by calling Lori at x6615. The Fermilab Film Society will have a double feature on Friday, November 14 at 7:30 p.m. (Note the early start time.) The feature movies will be Alien and Aliens.